Lloyd J. Reynolds has resuscitated the Japanese tanzaku, a form of ephemeral poetry, and placed it in a Pacific Northwest context, combining fine calligraphic artistry and the brevity of haiku with craft innovations to produce a unique poetic form. A rare, one of a kind publication. 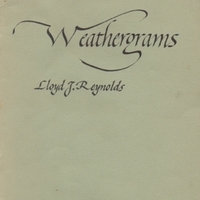 Reynolds, Lloyd J., “Weathergrams,” The Haiku Foundation Digital Library, accessed April 20, 2019, https://www.thehaikufoundation.org/omeka/items/show/1232.